With ruses they shall make war" that is the motto of the legendary infantry unit of the IDF that works deep in the territories the "Duvdevan unit". In accordance with their motto, this cunning Israeli army unit performs many of its operations under the guise of regular civilians in the territories. 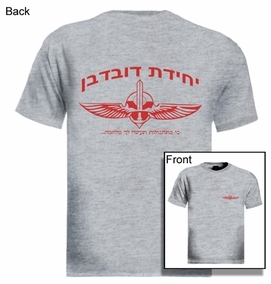 This "Duvdevan Unit T shirt" adorned by the Duvdevan symbol of the "Double Ended Sword" and the Hebrew caption "Duvdevan Unit" (front and back) is as awesome as the awesome unit it represents. Totally cool a must have item! Our t-shirts are made of 100% cotton and are long lasting with bright colors. Our products are all designed and printed in Israel.